If you're having trouble asking for the sale in your business, you're not alone! Whether your selling something for $30 or $30,000 there is a formula for mastering sales. If you don't master sales in your business you just have a hobby. And you can't make a difference in the world if you can't master this process because people won't know about your products or services. First off you have to get over yourself, and think you're being SALESY. Here's the truth, you are not being pushy if you are creating a caring conversation in showing the value of how you can transform someone's life. Mastering sales is about mastering yourself, and the ability to listen and ask the right questions. It's never about pushing someone into what they don't want. That's very old school tactics and it's not what we're talking about here on the show. It's time that you OWN your power and master the art of sales. The power of your questions DOES determine your life! Watch this episode and let me know your thoughts! Sales Maven offers one-to-one business mentoring, coaching and sales trainings for entrepreneurs. We also offer sales team assessments and training for corporate sales teams – large and small. 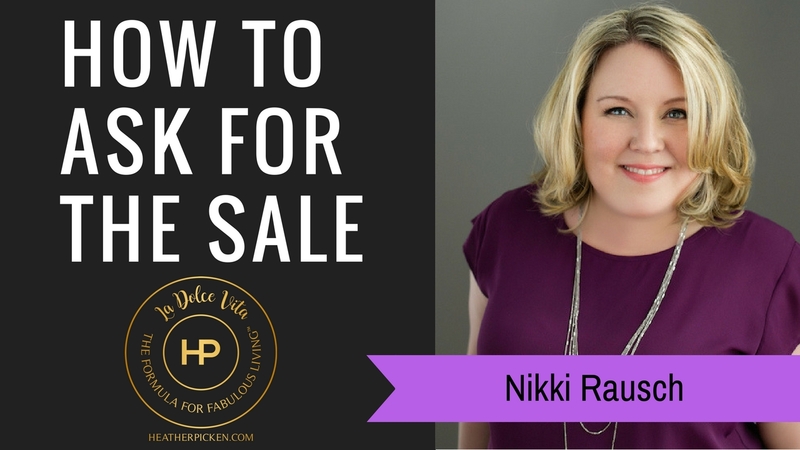 Sales Maven founder Nicole “Nikki” Rausch is a business mentor, coach, speaker, and best selling author. During her 22+ year sales career working for large companies like Hitachi, she’s gained extensive knowledge in the art of relationship selling. Nikki has a track record of closing some of the largest deals in the history of the companies for whom she has worked as well as cultivating profitable customer relationships. She’s sold to organizations such as The Bill & Melinda Gates Foundation, Johnson & Johnson, Hewlett Packard, Clark County School District, Seattle Public Schools, University of Washington, & NASA. Nikki is an accomplished and revered communications coach, speaker and sales trainer whose expertise includes distilling and clearly conveying complex information to broad audiences. Her two books, Six-Word Lessons on Influencing with Grace: 100 Lessons to Genuinely Connect with Colleagues, Friends, Family, and Lovers and Buying Signals, How To Spot The Green Light & Increase Your Sales are both available on Amazon. Nikki holds a B.A. in Business Administration from the University of Washington and a Master Certification in Neuro-Linguistic Programming. She has been honored several times as a ‘top-producing sales person’ and ‘outstanding business partner’, and was featured on the cover of Female Entrepreneur Magazine in 2002.